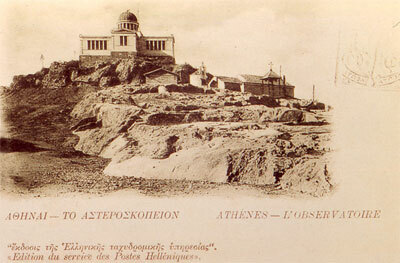 The NOA (National Observatory of Athens), as well as other buildings of social or scientific value in Athens, was charity of rich Greeks of the diaspora. More specifically, the Sina building, the NOA's first , was charity of the Sina family. G. Sinas, who served as a Greek consul in Vienna, gave 60,000 drachmas to the University of Athens on August 12th 1840 for the foundation of the Observatory. A council of sages was composed to appoint the best position for construction, which proved to be Lofos Nymphon (Nymphs Hill), by architech E. Schaubert and professor Vouris. The foundation stone of the institution was placed on June 26th 1842 based on plans by Schaubert and the ceremony took place at 8 o' clock in the morning under a total solar eclipse. Subsequently, Schaubert, T. Hansen and the astronomer Schumacher co-operated for the building's interior design. In October 1842 T. Hansen took up the fruition of the plans, keeping Schaubert's byzantine cross-shaped form but also giving the building the neoclassical style Otto wished. The building's construction commenced in October 1843 and was completed in the spring of 1846. Ever since, the Sina building has stood as a wonderful example of excellent neoclassical architecture atop Lofos Nymphon in Athens' historical centre, next to Pnyx. The NOA, which was housed during its first phase of operation in the Sina building, was founded in 1842 and comprises the first and oldest research institute of Greece. After its construction, Baron Sinas equipped it with astronomical and meteorological instruments such as the Starke and Ploessl telescopes, the Bertoud and Kessels pendulums, the Kessels timepiece, five lenses and a full set of meteorological instruments. Unfortunately, the Observatory's operation was not always stable due to management problems. Professor Vouris worked intensely in Athens but in 1855 he resigned because of health problems, returned to his birthplace Vienna where he died on July 14th 1860. During his direction, Professor Vouris was involved with meteorological observations, study of the Greek nature, geography and astronomy. He also published a series of important works such as “Geodetic measurements in Attica”, “On observing and studying Mars' diameter”, “Defining the longitude and latitude of Athens” etc. Due to Vouris' illness, Baron Sinas appointed german astronomer Johann F. Julius Schmidt as the second NOA director, who arrived in Athens on December 2nd 1858. Schmidt's work is important and covers a range of subjects such as astronomy, selenography, meteorology, altitude measuring, botany and seismology. He also published “Publications de l'Obervatoire d'Athenes”. Schmidt added new instruments to the Observatory's equipment as well as new and rare books, using the Baron's funding. Schmidt was a famous scientist of his time. He published numerous studies and from January 1855 until the end of July 1874 he drew the map of the Moon, which he sent to Berlin. Despite his rich scientific contributions during his direction, the Observatory faced many management problems. The Athenian sky and its clarity, as well as his opportunity to direct NOA, helped him decisively to complete his monumental work, the map of the Moon. After Schimdt's death, M.D. 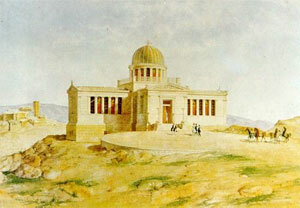 Kokkidis, Astronomy professor, assumed temporary direction of the Observatory up until 1890. Kokkidis improved the meteorological instruments, while Vouris handled observations. Meanwhile, use of the meridian telescope begun for determining local time. After Simonas' Sinas death, his wife Ifigeneia continued funding the Observatory until her death in Vienna in 1885. In 1890, the Greek government decided to re-open the institution with D. Aiginitis as its new director. The building, as well as the instruments and books had been abandoned for some time and were all in bad condition. The building was under repairs from Autumn 1890 to February 1891. During the following 5 years (1891-1896), new departments were created and new staff was employed. Initially, a network of twenty-two meteorological stations was installed in many parts of the country and the work “Practical Meteorology” was published, providing instructions for the stations' operation. Additionally, the “Bulletin Meteorologique”, which included weather forecasts, started being published using data from 55 stations abroad as well as the 22 Greek ones. “Greece's climate” followed, creating a library comprising 4050 volumes. Subsequently, with the purchase of new instruments such as the seismoscope and the help of the meteorology stations, a number of volunteers and the telegraphic service, the third department of the Observatory was formed: the department of geodynamics. Meanwhile, a new timekeeping service was set up for setting and studying nautical timepieces, enriching astronomical instruments and determining local time using a new telescope, courtesy of Ionidis. Twenty electric Hipp clocks and a single magnetic tuner, all given by M. Zarifis, were also added to the Observatory's equipment. The Observatory's garden was created using water provided by the Municipality of Athens. By 1896 the NOA had achieved significant development with many research departments in full working order. With the help of the Ministry for Public Education, by 1895 a new functional organization was voted for, dividing the Observatory into the departments of Astronomy, Meteorology and Geodynamics. Last but not least, printing of “Annales de l'Observatoire National d'Athenes” in French commenced during that period. That is where data on the departments, stations and the staff's research was published. Since 1842, the Sina building has been renovated quite a few times while its scientific activity, following the current, expanded into many fields so as to range today from the Earth's interior to Deep Space. Its five institutes, which today cover a wide scientific spectrum, are housed in several newer buildings according to their needs. The Sina building was converted into a museum in 2008 and is where the historical library, as well as the collection of old instruments is kept today.